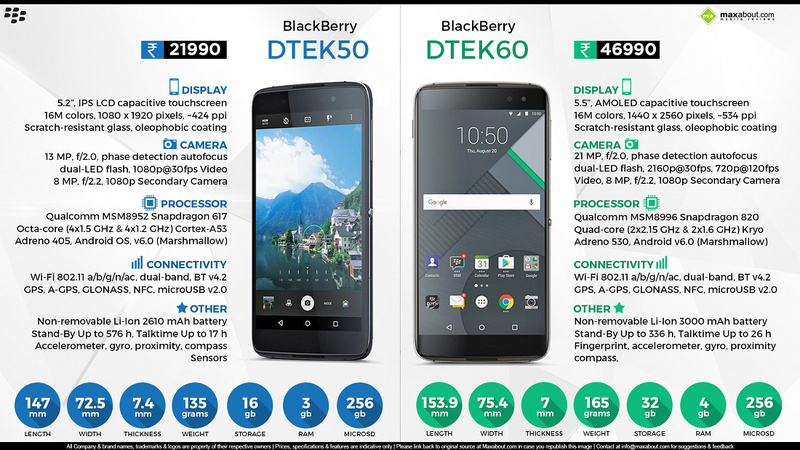 BlackBerry has recently launched its smartphone duo, DTEK50 and DTEK60 in India at a price tag of INR 21,990 and INR 46,990 respectively. The DTEK50 will be available in India from this week while the DTEK60 will enter later in December. The first one was internationally launched in July while it took a lot of time for the company to bring it to the Indian shores. The best part is that both phones are running on Android 6.0.1 with BlackBerry's custom UI on the top. The phones are offered with BlackBerry Enterprise Services and DTEK by BlackBerry app, making it the most secured Android phone around the world. They are also said to be ready for Enterprise Mobility Management Solutions. Apart from that, the DTEK60 also uses a fingerprint reader at its back for enhanced safety. The DTEK50 comes with 5.2 inch, full HD display with 424 ppi. The Octa Core Snapdragon 617 on the phone comes with 3 GB of RAM and 16 GB inbuilt storage. The front camera used in DTEK50 is 8 MP while the rear is 13 MP with PDAF, 6 element lens and dual tone LED flash. It carries a 2610 mAh battery with quick charge 2.0, offering 50 percent battery in 51 minutes. The phone weighs just 135 grams and comes with a thickness of 7.4 mm only. BlackBerry DTEK60 is a top spec smartphone with 5.5 inch Quad HD display with 534 ppi. It comes with Quad Core Qualcomm Snapdragon 820 SoC with 4 GB of RAM and 32 GB of inbuilt storage. The phone comes with 21 MP rear camera with PDAF while the front is the same 8 MP as the DTEK50. It comes with a 3000 Ah battery and uses quick charge 3.0. it is even thinner at just 7 mm while weight goes up by few grams to 165 grams. Both the phones support Indian 4G LTE bands.